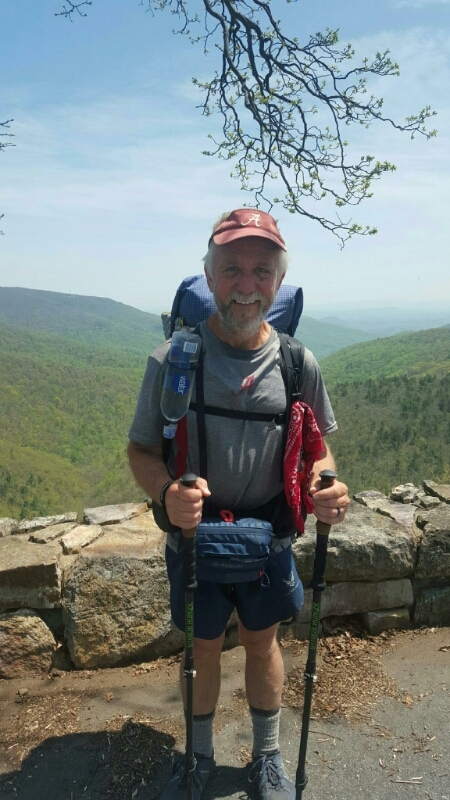 Lee Richards, Pigweed, at 55-years-old, began his Appalachian Trail adventure on February 27 from Springer Mountain. 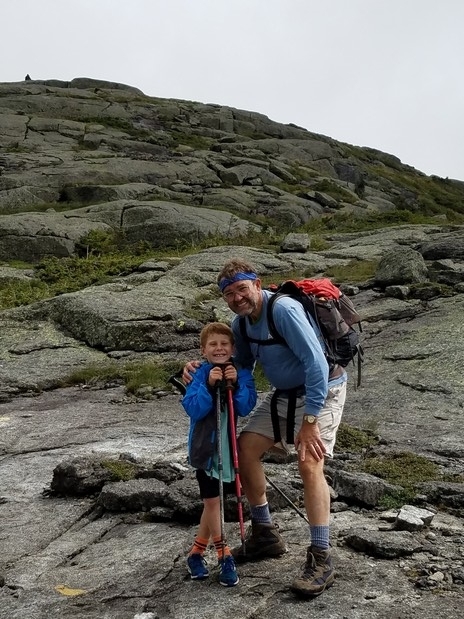 He started his trek with a long-term hiking partner and work colleague, Greg Grant. They hope to hike the first 40 miles together. 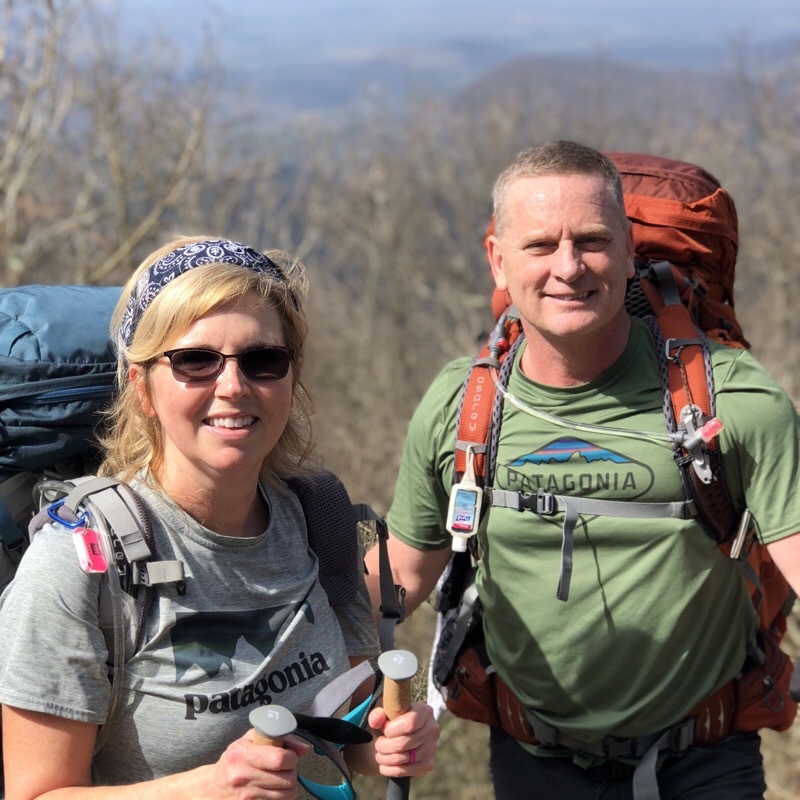 Pigweed’s wife, Cindy, dropped the two hikers off at Amicalola Falls on the 26th and they began their trek on the AT on the 27th. Their first day on the trail logged 10.5 miles as they made camp at Horse Gap. 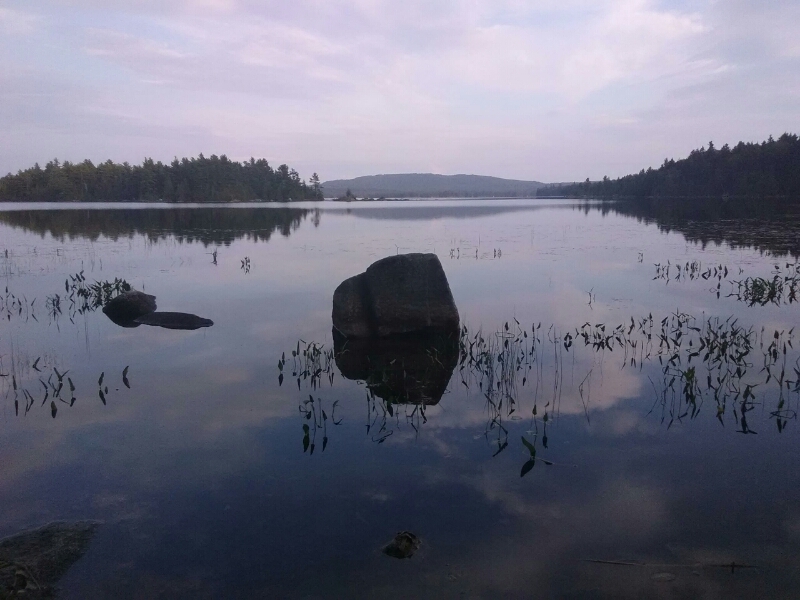 It was a beautiful first day, but rain is promised for the next two. The rain did not disappoint. 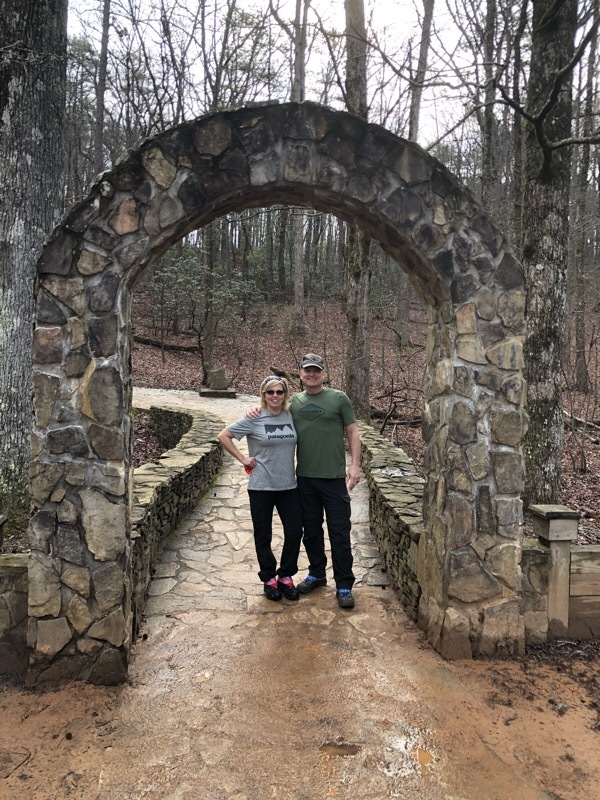 They hiked 6.5 miles to Gooch Gap, called a shuttle service, and caught a ride into Dahlonega. They spent March 1 in Dahlonega avoiding the harsh weather. 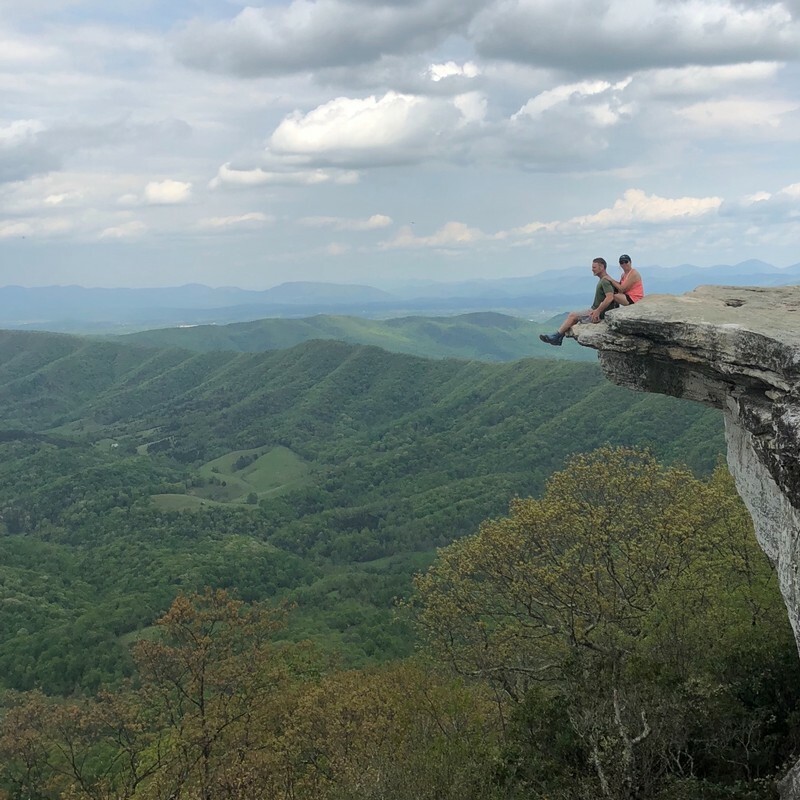 They were hoping to do a 7.5-mile hike on March 2 (Lance Creek) and then arrive at Neel Gap on Saturday. Greg’s car is waiting at Neel Gap and most likely Pigweed will stay at the hostel there on Saturday night. What an interesting trail name. Here is the history behind it: Pigweed is a family of weeds (Amaranthus) that are resistant to many herbicides and are an increasing problem for farmers to control. They are an industry scourge for the Agricultural Business in which I work. They are terrible in the South and moving up into the Midwest. When I was jawboning with my buddies about a trail name, an article appeared in a trade magazine “Pigweed Marches North”, and my trail name was born PIGWEED. Hickory is a mystery hiker and the last of the trailjournal.com thru-hikers to start in February. I do not know his real name, or where he is from. There is only one photo posted so far as an I.D. picture. 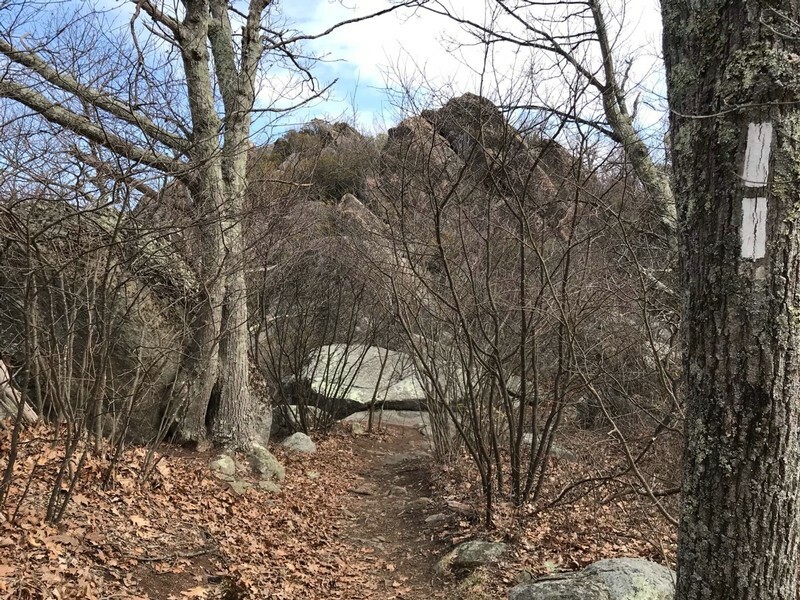 He stepped out on the Appalachian Trail on February 27, but this was not his first visit to the trail. In fact, this is his 5th attempt to hike the AT. 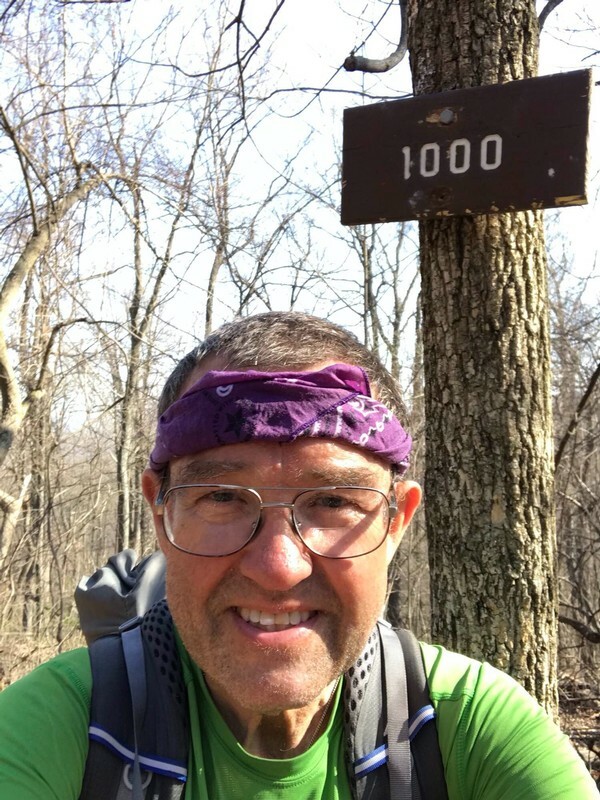 He completed a thru-hike in 2011 and is back to experience the trail again in 2018. 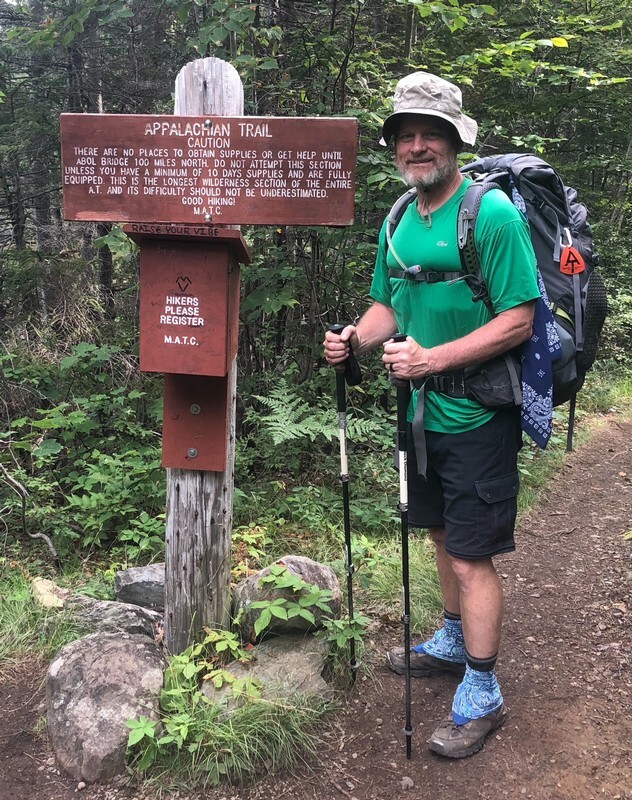 He made it to Hawk Mountain Shelter on day one (8.1 miles on the AT) and then to Big Cedar Mountain (another 14 miles northbound) by the end of day two. 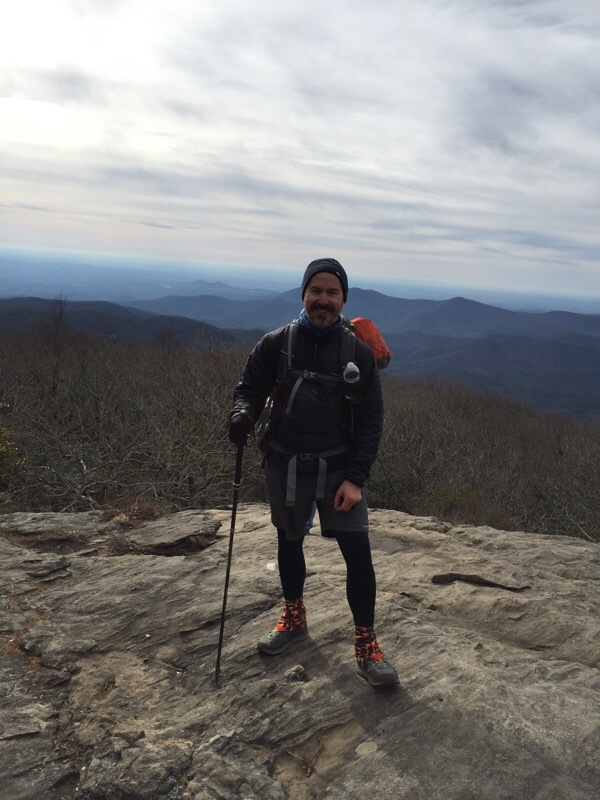 My friend, Bruce Matson, RTK, left for the AT on February 25th. 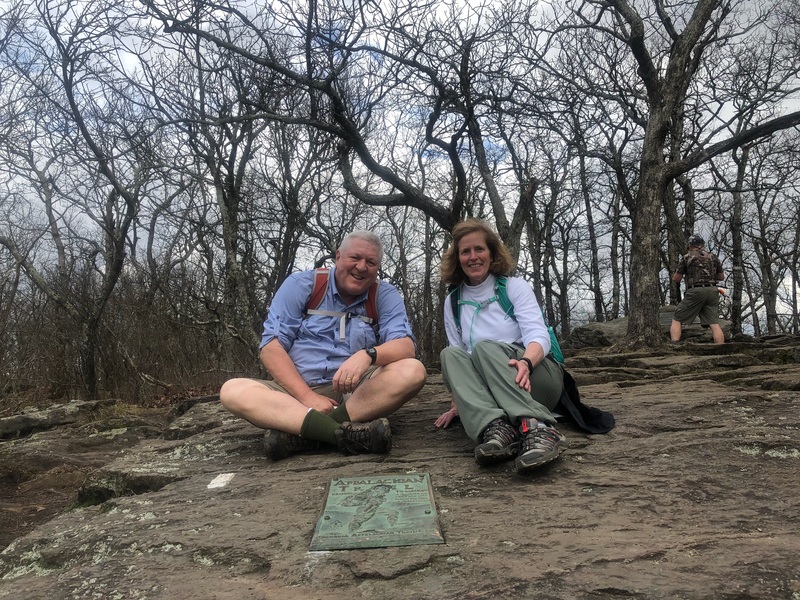 Attached is a picture of Bruce and his wife, Cheryl, at the summit of Springer Mountain. But I have heard nothing from him since that date. He has a website and no news has been posted. I am not sure what to think, but if he checks in and gives an update, I will include him in my early starters and keep you up-to-date on his progress. So that concludes my trekking cohort of early hikers (beginning in January or February) on the Appalachian Trail. I am following 14 hikers. If the percentage holds true, only 20-25% of these folks will make it (somewhere between 2.8 and 3.5 people). I am hoping for at least four. Stay tuned and relax as these adventurers take us on their journeys to Maine. 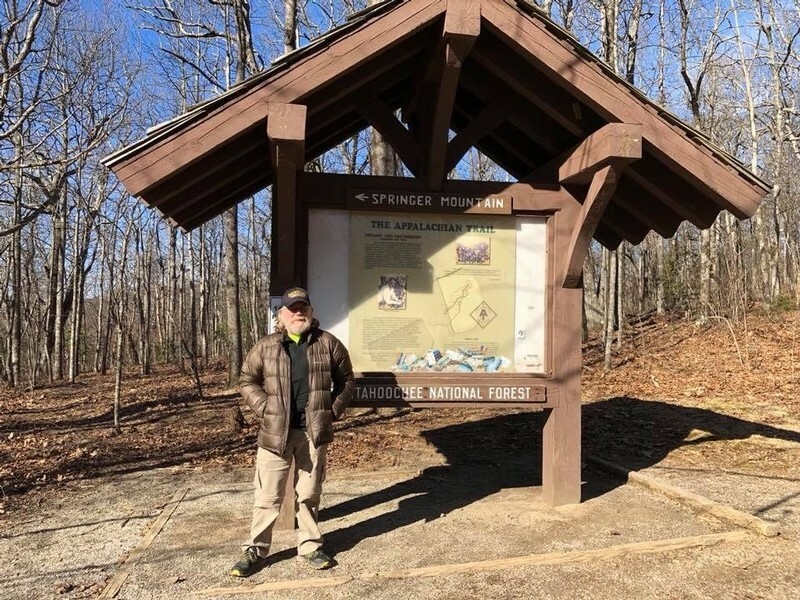 Zin Master began his thru-hike of the Appalachian Trail on January 23, 2018, in Springer Mountain Georgia. He hiked 7.4 miles on Tuesday the 23rd. 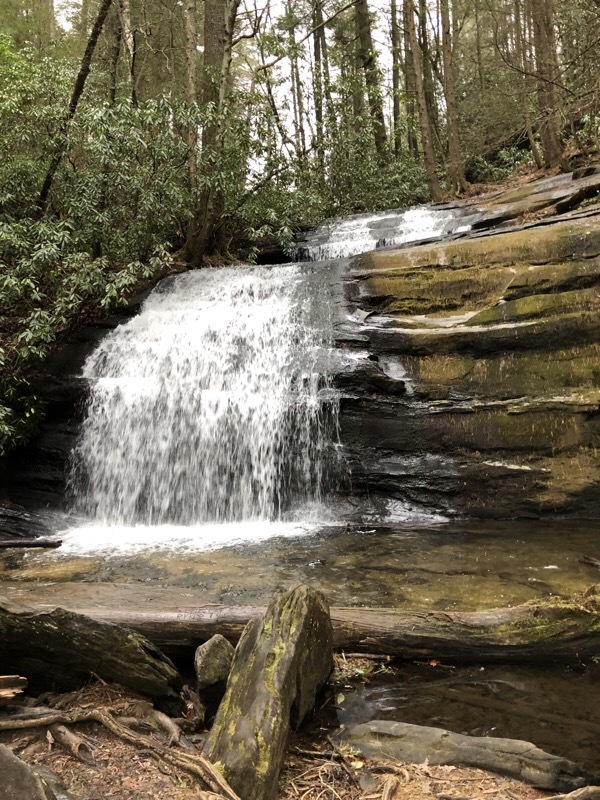 Wednesday’s hike was 8.3 miles; Thursday equaled 8.1 miles; Friday (1/26/18) totaled 7.3 miles including a climb over Blood Mountain into Neel Gap. Zin had developed some major blisters on his feet and decided to get off the trail to allow for some physical healing. Fortunately, his in-laws live in Kingsport Tennessee, so he traveled by bus to retreat with family. Zin needed to address a couple of hiking issues in addition to his blisters. He needed to find a more comfortable boot/shoe and he needed to replace a broken trekking pole. 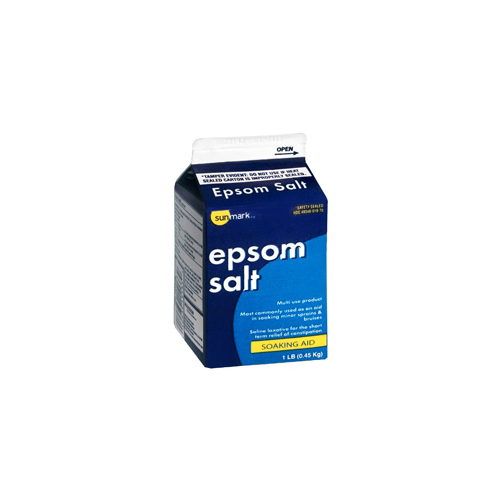 Zin began a daily soak of his feet in warm water and Epsom salt and then moisturizing them with Aquaphor. 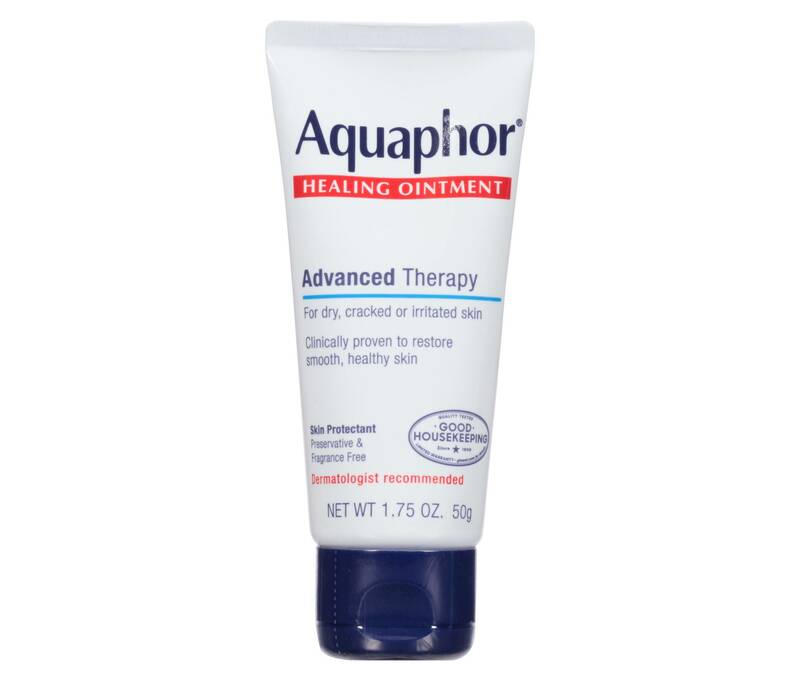 I used Aquaphor on my feet in 2014 and not only did it keep the skin from cracking but it left them a water resistance almost like a waxy, oily film. It doesn’t sound very good, but it truly helped maintain strong and happy feet. Zin found some longer and wider shoes (14W) and was able to find someone to modify his inserts to fit his new Keens (which he had to order). He sent his Leki trekking pole to the company who is making repairs and sending them back to him. As of February 7th, he is still waiting for his new/repaired gear. Zin has also checked on transportation back to the trailhead at Neel Gap. The bus ride was long and involved traveling to Tennessee, but it was going to be horrendous on the return trip – 20 hours including a 10-hour layover in Atlanta. So, he has decided to rent a car for a few more dollars than the bus ticket and he will be able to drive with 13 miles of the trailhead in 4 hours. He will then be able to get an inexpensive shuttle to the trailhead itself. 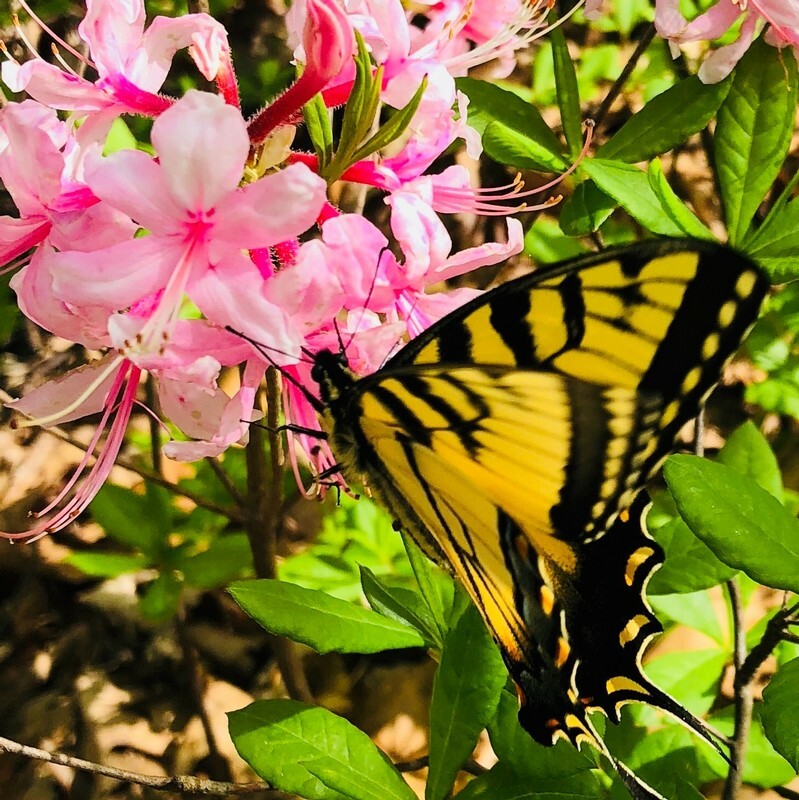 He has been on the trail for four days and resting in Tennessee for twelve days. Once those shoes and trekking poles arrive, he should be healed and ready to move. It must be discouraging to have to wait, but maybe the weather will be warmer as he moves forward. Hopefully, he will be on his way toward Maine by this weekend. 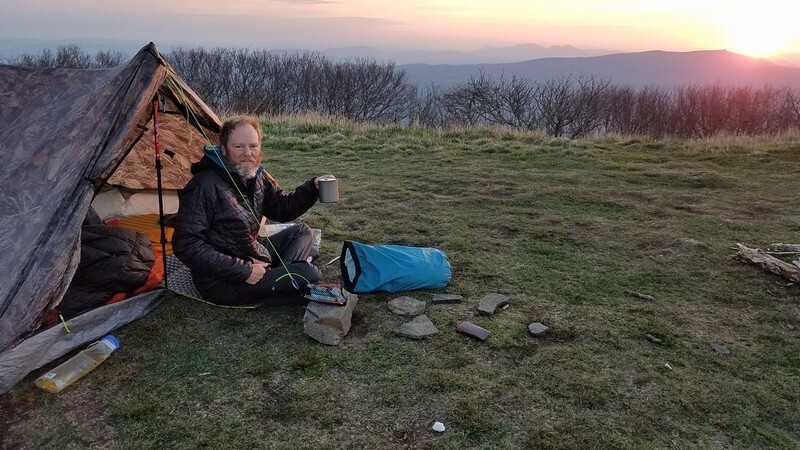 Jack Masters, aka Vagabond Jack, is from Kansas City, Missouri but for the next several months he hopes to be homeless as he travels the Appalachian Trail. 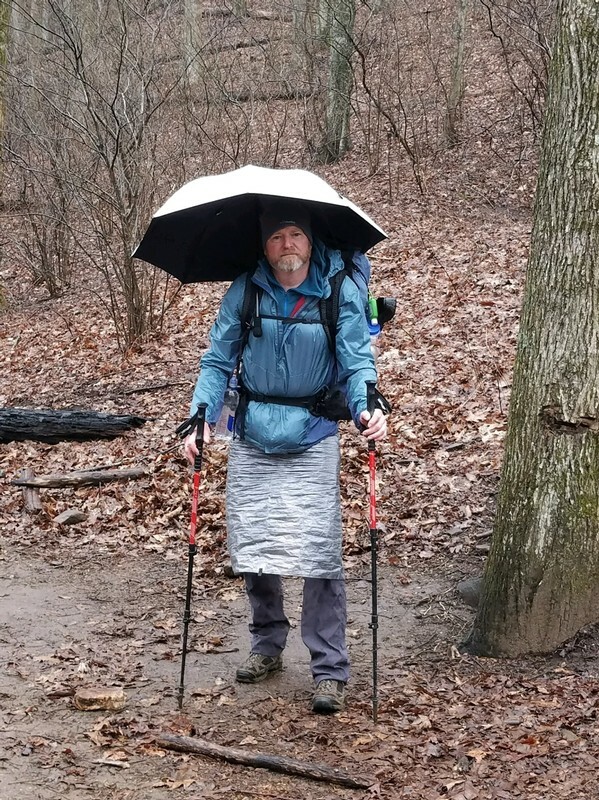 He began his thru-hike on February 1, 2018, with the dream of hiking 2,200 through 14 states from Georgia to Maine. Vagabond Jack retired at the age of 66 as a database engineer. The year of 2017 was a major year of transition for Jack. His wife passed away after a 5-year illness. Since the sadness of her death, Jack sold his house and all his possessions, purchased a truck camper, and traveled around the country. He has longed to hike a long trail for many years but could not decide which trail to choose. Vagabond Jack heard a podcast by Mighty Blue (a fellow AT Thru-hiker in 2014 that I hiked with for a few days). Mighty Blue was sharing about a Fat Guys Hike that would last a week on the Appalachian Trail from Newfound Gap southbound through the Great Smoky Mountains. 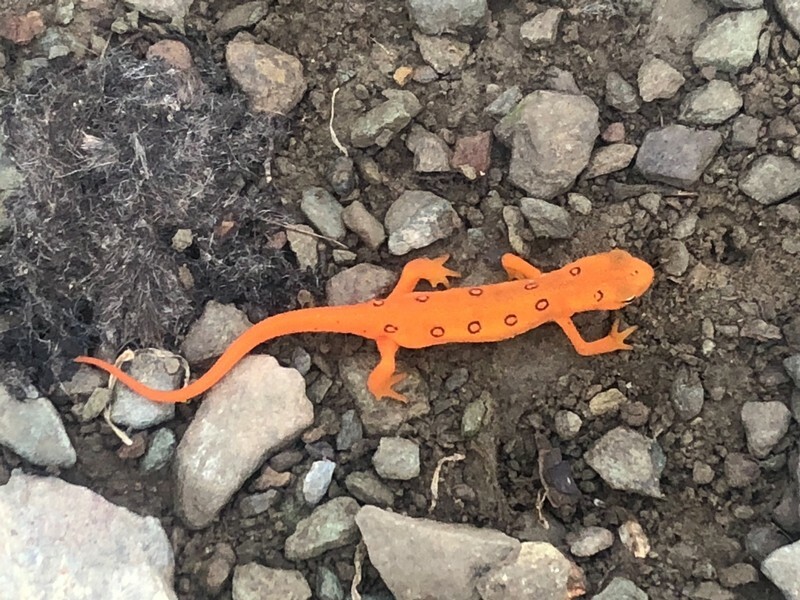 He joined the group, was challenged by the trail, but decided to thru-hike the AT anyway. On January 31, Vagabond Jack drove his truck camper to Georgia and put his rig in storage in Marietta. 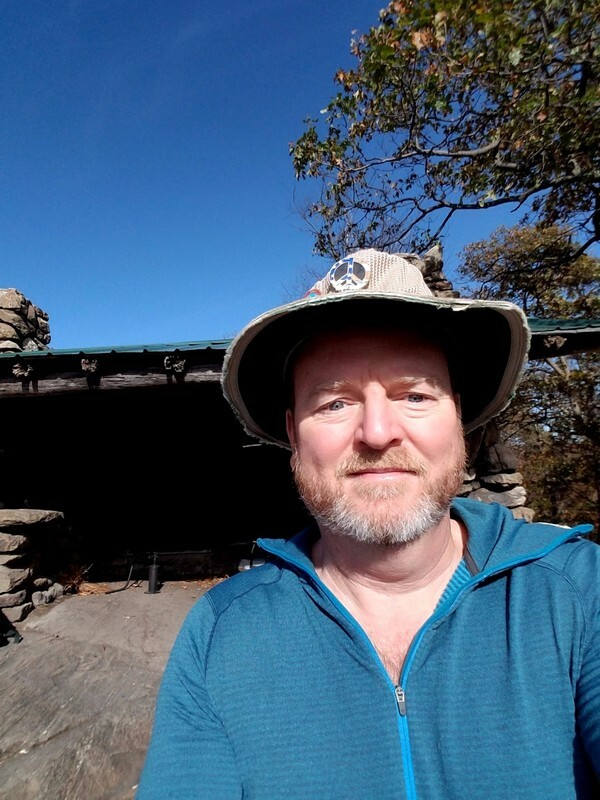 He arranged a shuttle ride from Marietta to Amicalola Falls State Park, where he officially signed in at the welcome center as a thru-hiker number 29. He entered his starting pack weight at 25 pounds. The shuttle driver then took Vagabond Jack to the parking lot located 1 mile north of Springer Mountain (the southern terminus of the AT). Jack then hiked 0.8 miles to the Springer Mountain Shelter to spend the night. After a cold and windy night, on February 1, Vagabond Jack Hiked the remaining 0.2 miles to the summit of Springer. 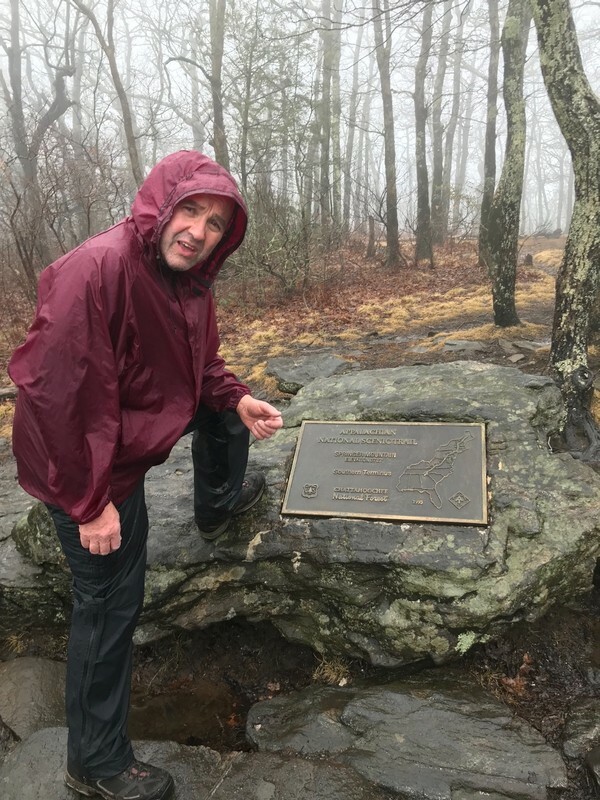 It was a foggy hike, but Jack reached the iconic rock summit, took some pictures at the commemorative plaque, then turned around and began his trek of the AT. The weather improved throughout the day, but Vagabond soon realized that he had taken a wrong turn. He walked for about a quarter mile when he realized his error. He backtracked and successfully found the white blazes once again. About 3:30 in the afternoon, he came upon Joe, a section hiker that camped along Jack the night before. Joe was ready to call it a day and planned to take a short side trail to Long Creek Falls. Vagabond Jack was hoping to hike on to Hawk Mountain shelter (another 2.9 miles). 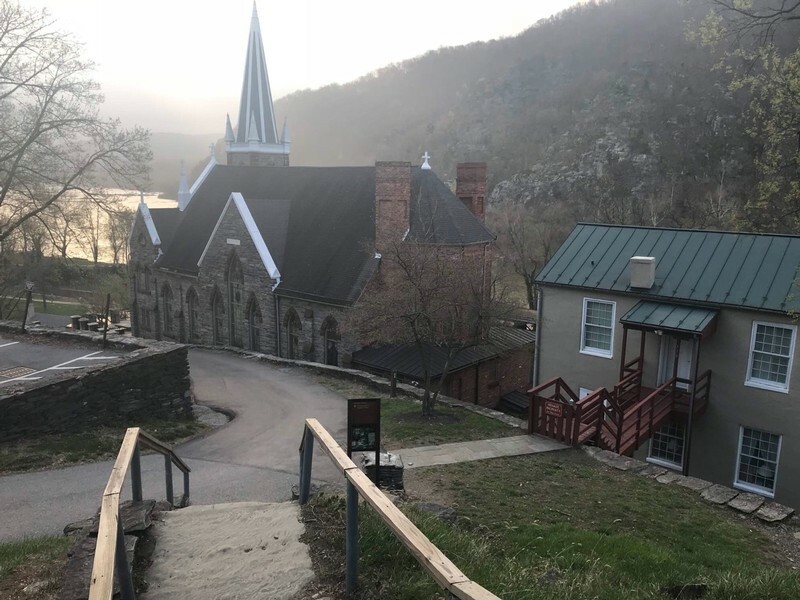 However, he calculated that it would be close to sundown by the time he got there, so he agreed to go to the falls and find a place for the night. Having hiked 5.2 miles on the AT, they pitched their tents and had an early dinner. Joe built a campfire, but they went to bed early. Jack woke up around 6:00 am but snoozed another half hour before crawling out of his toasty sleeping bag. 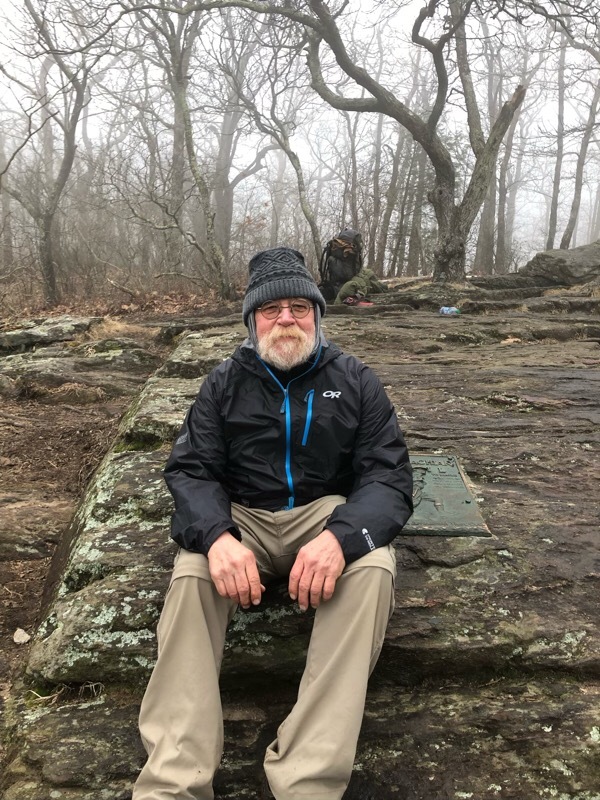 His goal was to hike 10 miles to Gooch Mountain Shelter. By 7:00 he was packing up his tent when Joe rolled out of his tent. During the night, Joe’s tent had leaked soaking his sleeping bag. He was shivering and extremely cold. Jack pulled out his stove and made him a hot cup of coffee. They packed up and headed down the trail, but after a mile, Joe indicated that he needed to get off the trail. They called for a shuttle ride and hiked another 2.4 miles to a road crossing at Hightower Gap. Because of the time lost with Joe’s struggles, Jack realized that he could not make it to Gooch Mountain. The weather report looked intense for the weekend, so Jack decided to ride with Joe into Dahlonega and find a room until Monday. He has had a slow start, covering only 8.6 miles in two days, the weather report looks better for the coming week. I will give you an update when Vagabond Jack hits the trail again. Check out his journal and photos at www.trailjournals.com/journal/22304. 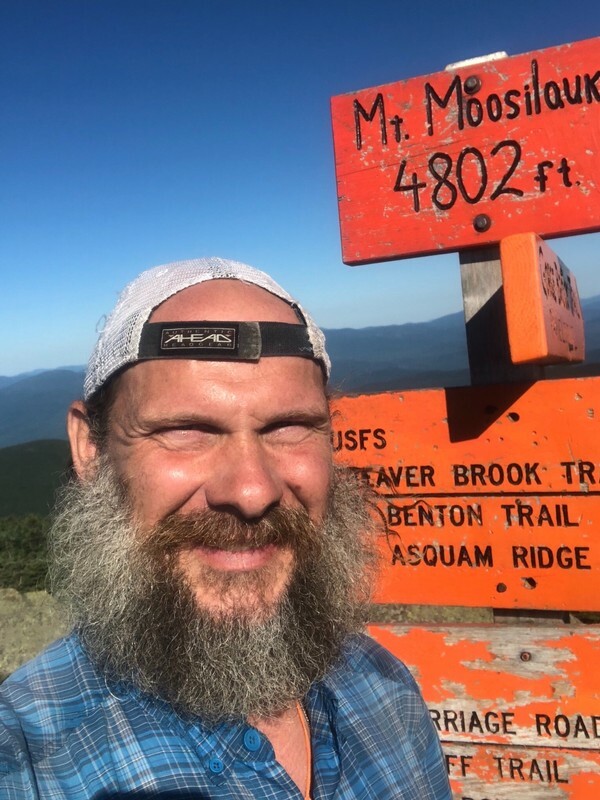 September 24th was my anniversary, not of my marriage to the best wife in human history, but of my climb to Mount Katahdin and the completion of my thru-hike of the Appalachian Trail. Although that day does not hold a candle to my wedding day or the days of the birth of my four incredible children, it was a significant day, capping a physical, emotional, and spiritual journey that lasted five months. The adventure, up and over fourteen states and through some of the most beautiful land I have even seen, has made a deep and long-lasting impression on my life. This week, I picked up my journal and began to reminisce on that incredible adventure. On April 26, 2014, I had no real idea of what was ahead of me when I woke up in my son’s home just north of Atlanta, Georgia. 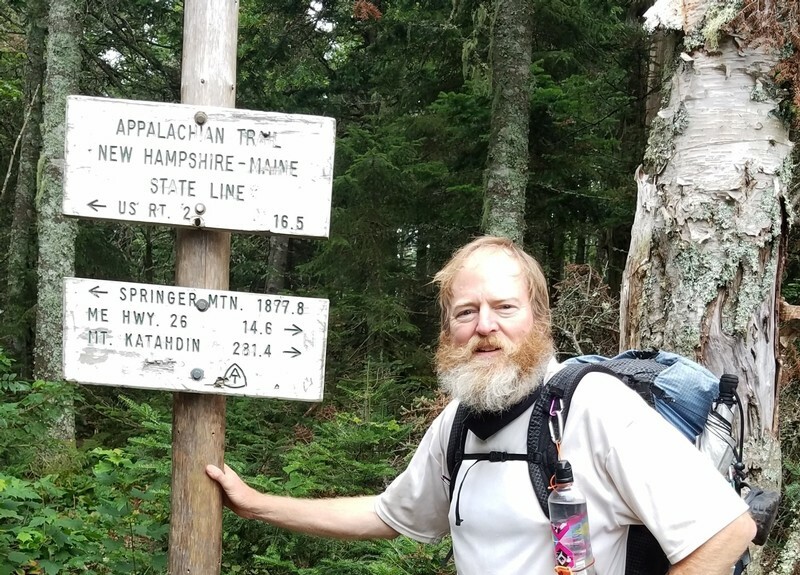 I had read close to two dozen books about the Appalachian Trail, including several personal journals of thru-hikers; I had attended a half dozen seminars from how to make a fuel-oil stove to how to make a successful thru-hike of the AT; I had trained physically for fourteen months, hiking 2,200 miles before setting foot on the THE trail. But head knowledge and hiking in Ohio, is a far cry from really living and experiencing, up-close-and-personal, the path from Georgia to Maine. My wife, Cathy, and I had driven from Springboro to Atlanta on Friday, April 25. My son, Ben, his wife, Vanessa, and their two beautiful little girls greeted us with enthusiasm. They were excited about my crazy idea of hiking 2, 186 miles. I did not sleep too well with the “unknown” bouncing around in my brain. I woke up around 6:00 and before long I could smell the chicken-bacon and eggs breakfast awaiting me in the kitchen. Three of us (Ben, Cat and I) were pulling out of the driveway and on the road to Springer Mountain by 7:30. Instead of hiking the 8.5-mile approach trail from Amicalola Falls up to Springer Mountain, I talked Ben into driving to a parking lot at Big Stamp Gap, one mile north of the summit of Springer. All three of us hiked the mile up to Springer, took lots of pictures, and made the hike back to the car. I remember the mix of emotions that filled the moment of goodbye: feelings of gratitude for my son, driving me to the starting point; feelings of concern for Cathy’s road-trip back to Ohio by herself; feelings of sadness in my heart not knowing when I would see my wife again (I was so fortunate to be able to see her four times during my journey); feelings of excitement for a journey that I had literally dreamed about for over a year; feelings of apprehension knowing that only 25% of thru-hiker wannabes make it to the finish line; and feelings of inspiration having sensed a call to the trail and having received the support of my wife, my kids, my sister, and so many Christian friends; and finally feelings of fear, facing the unknown by myself with very little experience in the back-country. With last minute hugs and kisses, I turned to face the trail about 9:30. I knew there were several possible hiking goals for the day. There was a shelter 2.8 miles from Springer (Stover Creek Shelter), but I was determined to go further than that. 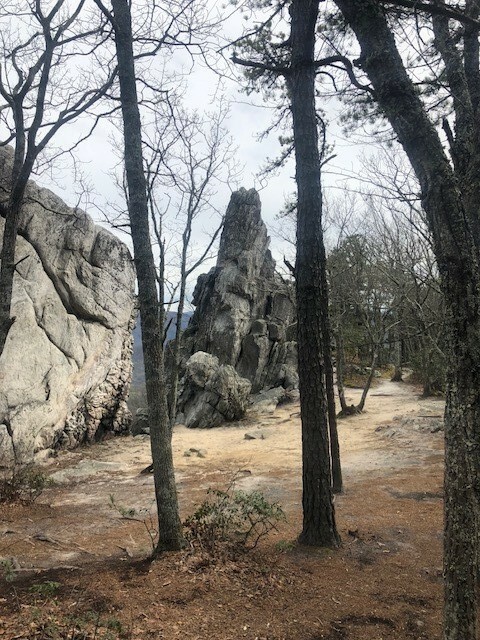 At 8.1 miles, a second shelter, Hawk Mountain Shelter, might be a possibility. Fortunately, I got there around lunch time and enjoyed my first meal sitting in my ultra-light chair at the blue blaze leading to the shelter. 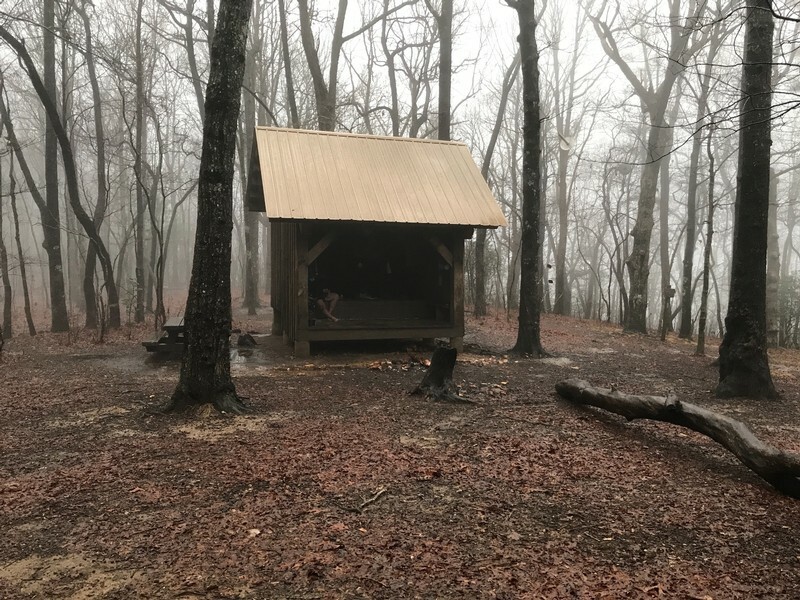 The next shelter was at mile marker 15.8, seven more miles down the trail, at Gooch Mountain. I was feeling good and I felt fairly confident that I could do seven more miles in three hours. At mile 10.5, I ran into my first significant mountain, Sassafras Mountain. In one mile of trail, the elevation rose 661 feet. Huffing and puffing, I slowly made it over the mountain, down over the other side and into Copper Gap, only to find Justus Mountain, another nice climb, welcoming me to the AT. The hike was tiring but I was happy when I pitched my tent along the trail about a mile past Gooch Mountain Shelter. 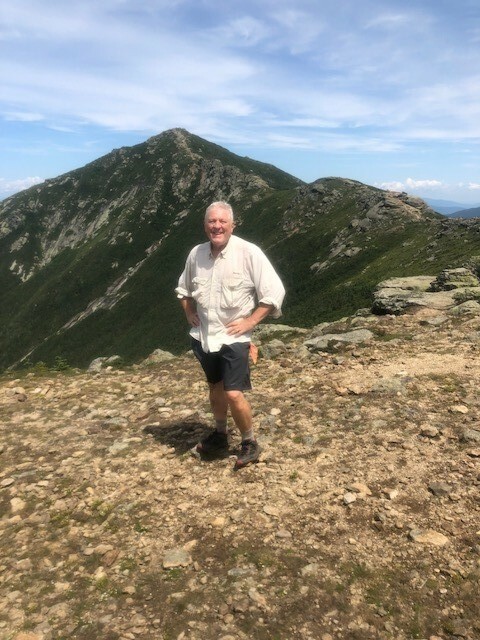 It was 5:30 and I had hiked 17 miles (16 miles moving NOBO toward Maine and 1 mile from the parking lot to the top of Springer) – not bad for the first day. There were more emotions at the end of the day. Arriving at camp I was nervous about setting up my tent (I had no major problems, although I got much faster as the hike progressed); concern about my appetite (I was not hungry at all, but my thirst was keen. I had two pop tarts for lunch, some GORMP along the trail, but dinner did not appeal to me); tired but content (it was a good tired – satisfied with the day’s adventure). 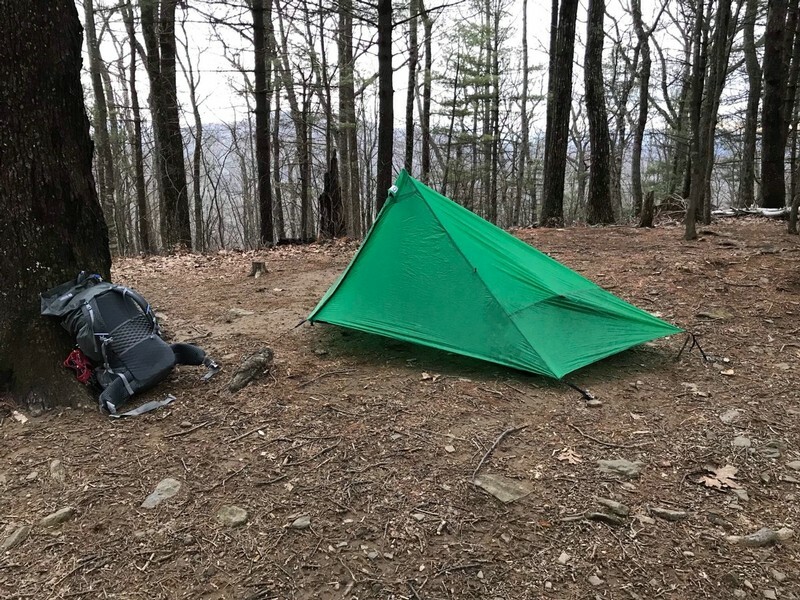 I remember crawling into my tent so excited about actually being on the AT, feeling so good about the distance traveled; wondering what tomorrow would look like; and ready for some sleep…. it was 7:30.